As galleries begin to open after a winter hiatus, February’s First Friday shows feature exhibits at South Peninsula Hospital and the Kachemak Bay Campus by artists creating outside their day jobs. Dr. Edson Knapp will show photographs in the hospital gallery from a trip he took with his wife, Dr. Renda Knapp, to Nepal last April. At the college, Soldotna lawyer Joe Kashi will show his fine art photography. At Bunnell Street Arts Center, augmented reality artist Nathan Shafer will display art from his new series, Wintermoot. Shafer debuted his interactive art last summer at the Pratt Musuem. At Grace Ridge Brewery, don’t miss the unveiling of the winning label for a limited-edition run of the Kachemak Heritage Land Trust’s Brackish Brown beer. The exhibit includes the winner plus other entries in the contest. Ptarmigan Arts member artists will show “Passion/Compassion,” works inspired by what the theme means to those artists. Another group show is “9 Women, 9 Quilts” at the Homer Council on the Arts. A round-robin exhibit, the quilts feature rows started by one of the group’s quilters and passed on to the next quilter, so that the finished product includes sections by all the artists. East Ender galleries also continue, with shows at The Shop and The Dean Family Gallery out East End Road. To allow art lovers to see shows in town as well, both exhibits run until 9 p.m.
Wintermoot is an augmented reality comic book series produced by new media artist Nathan Shafer with the Shared Universe group that also produced the Dirigibles of Denali project which was on view at the Pratt Museum last summer. The series is an epic tale of many Alaskan superheroes over many thousands of years, with each issue focusing around two individual characters and their exploits. The first graphic work is about two Iñupiaq superheroes: Aqpik and her daughter Mars Apple, and was written and illustrated by Nathan Shafer. Copies of the comic will be available as affordable artist editions at the gallery. The Kachemak Bay Research Reserve will kick off its 20th year Anniversary celebration at Grace Ridge Brewing with the unveiling of the label winner for the Brackish Brown beer for the love of estuaries. The other label entries will be present and there will be a people’s choice pick for the contest. One hundred bottles of beer have been bottled with the winning label and will be available for your support and drinking pleasure. The beer is a brown ale with Kachemak Bay salt from Alaska Salt Co. and fresh hops from Oceanside Farms in Homer. A collection of themed quilts made by nine of Homer’s Kachemak Bay Quilters group. The nine quilts each have nine rows, with one row added by each of the quilters in turn over an 18-month period. Each quilt has a different theme, and as the quilts rotated every two months to another of the nine quilters, they designed their section in the theme of the quilt’s owner. For instance, Jane Regan’s quilt, called “My Mother’s Trunk,” features fabrics that were left to Jane by her mother, who was also a quilter. Jane created the first 48-inch-by-10-inch” row, and then passed her quilt — and the box of her mother’s fabrics — on to Janet Bacher, who designed and added a row using these fabrics before passing the quilt on to Ruby Nofziger. The theme for Soldotna photographer Joe Kashi’s show is “Somber,” and the statement will simply include the Oxford English Dictionary definition of “somber” and a statement that these are somber times, both our late winter weather and the broader culture at this point. Kashi is a trial lawyer in Soldotna. He received his bachelor and master of science degrees from the Masschusetts Insitute of Technoloy and his juris doctorate from Georgetown University Law Center. While at MIT pursuing other studies, he “casually” studied photography with noted American fine art photographer and educator Minor White. Since resuming serious photography in 2007, hehas had 20 solo fine art photography exhibits in Alaska and the Pacific Northwest, mostly at university and college galleries. He uses Olympus Micro Four-Thirds, Pentax full-frame, and 5×7 film view cameras, using the right tool for the job. Ptarmigan Arts Gallery presents “Passion/Compassion,” a member show featuring artwork that represents those values to the Ptarmigan members. It will feature an eclectic mix of mediums, including fused glass, paintings, photography, bead work, turned wood, and more. The show will run in February and March. 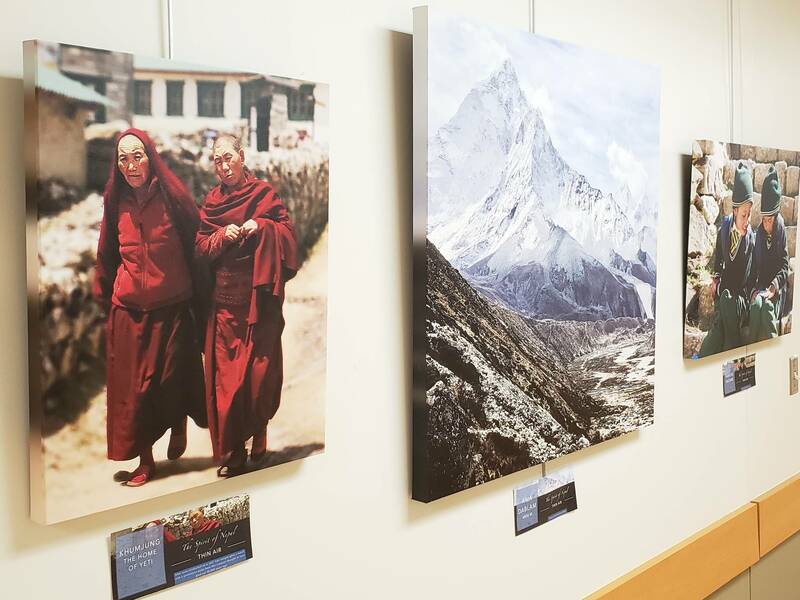 On display is a photo exhibit by Dr. Edson Knapp that he took during a Wilderness Medicine Trip to Nepal with his wife Dr. Renda Knapp in April 2018. The trip was part of Continuing Medical Education that included training in high altitude sickness, fractures in the wilderness, dangerous snakes, wilderness infections and water safety. While there, the couple, both on the medical staff of South Peninsula Hospital (Edson is an interventional radiologist and Renda is an OB/GYN physician) did an 18-day trip to Everest Base Camp which sits at 17,500 feet elevation on Mount Everest, the highest mountain on earth. They participated in a research study of how mountain living impacts sleep patterns, oxygen levels, exercise and more, by agreeing to share data collected from their fitbit accounts. Artist Sharon Trager shows “Coffee House Sketches: A Daily Practice,” with music by Michael Murray. Anchorage aritst Trager earned her bachelor of arts degree in Fine Arts from Eastern Michigan University. Her recent work is focused on figurative pieces in collage, painting and a bit of printmaking. Her collage work is included as part of the All-Alaska Biennial juried exhibit which featured work by contemporary Alaskan Artists. This exhibit began as a way to incorporate a daily drawing practice into her work.